Justin Bieber compares himself to Michael Jackson in a picture of him sitting on top of a car, the first picture he has posted since he was arrested on Thursday. We're not sure whether to laugh or feel even sadder for this troubled youngster. Justin Bieber believes he's just like the late Michael Jackson. The 19-year-old star was charged with drink driving, resisting arrest and drag racing in Miami in the early hours of Thursday morning leading him to liken himself to the late King of Pop, with a photo of him sitting atop a car with his left hand raised. 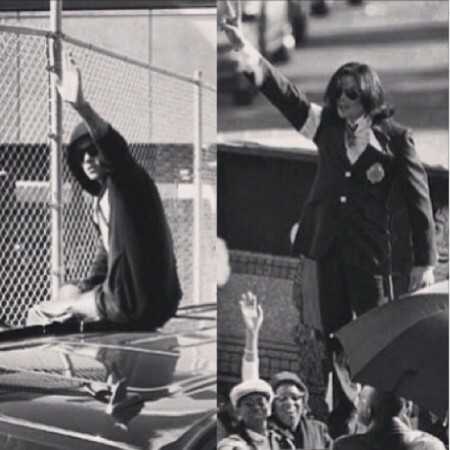 The photo is split with a picture of Michael – in a similar pose, standing on top of a car holding up a peace sign – taken outside a court in California after he had pleaded not guilty to seven counts of child molestation at a trial in 2004. Justin captioned the picture: "What more can they say." Michael was later acquitted but Justin is yet to answer to a judge regarding his charges. The Beauty and a Beat star was bailed for $2,500 hours after being jailed and as he left the courthouse jumped on top of a car to wave to fans and show he was okay. He is said to be avoiding his mother, Pattie Mallette, who apparently wants him to go to rehab. Stars including Ariana Grande and Lady Gaga have leant their support to Justin and his longtime manager, Scooter Braun, is also sticking by him. Scooter wrote on Twitter: "@justinbieber love you and i will act in the manner of someone who truly cares. that is all I have to say. thanks for all those concerned. Bottom line is we are defined by how we handle adversity. Be there when it counts. Love fully in good times and bad. (sic)"